In his recent decision in the case of Pittsman v. Dr. David Perrone, No. 11-CV-1235 (C.P. Lacka. Co. April 11, 2013 Nealon, J. 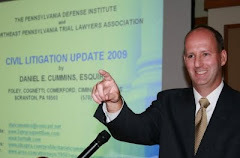 ), Judge Terrence R. Nealon of the Lackawanna County Court of Common Pleas granted a defendant's motion for summary judgment based upon the expiration of the applicable statute of limitations in a combined defamation and tortious interference with business relations lawsuit. The defense argued that defamation claims are governed by a one year statute of limitation under 42 Pa.C.S.A. Section 5523(1) and that, since the tortious interference with business relations was based upon the same allegedly defamatory statements, that separate claim should also be found to be time-barred under the facts presented. Judge Nealon held that when a plaintiff's tortious interference with business relations claim is predicated upon the same defamatory statements and actions serving as the basis for the plaintiff's defamation claim, both causes of action are governed by the one year statute of limitations rather than the tortious interference claim being subject to a two year limitations period. Anyone wishing to review Judge Nealon's decision in Pittsman may click this LINK.